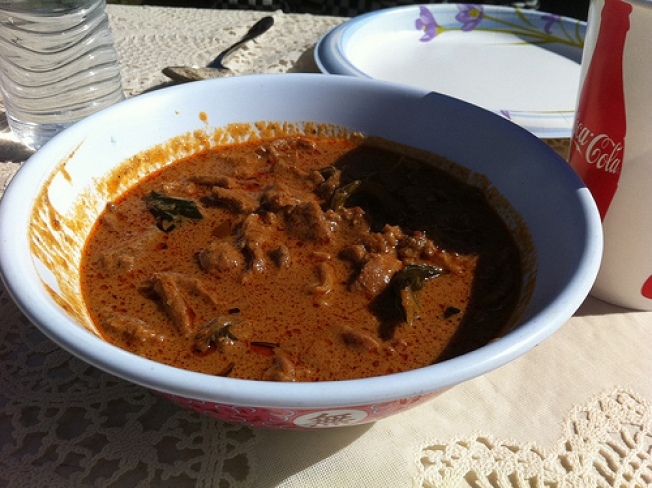 A rich, mildly-spiced meat curry over rice. Wat Mongkolratanaram, better known as the Berkeley Thai Temple, is one of those secrets that you’re excited to learn about, only to discover that everyone was already in on it. When my colleagues organized a brunch outing to celebrate the Thai new year this past spring, I was delighted to learn that one of the East Bay’s brunch locales is really a temple and community center. Wat Mongkolratanaram serves brunch only on Sundays, but the process is simple: arrive early, get in line, and exchange your cash for tokens. There are separate lines for different dishes and drinks and food can be eaten at the temple’s garden or packed up as take-out. The dishes are very reasonably priced, which means more sampling of what’s some of the best Thai food I’ve ever had. My colleagues and I shared our food family-style, and I got to taste a bit of everything. Everything arrived so quickly that I could hardly keep up, but the first dish I tried was a rich, mildly-spiced meat curry over rice. I was ravenous, so this quickly whet my appetite. 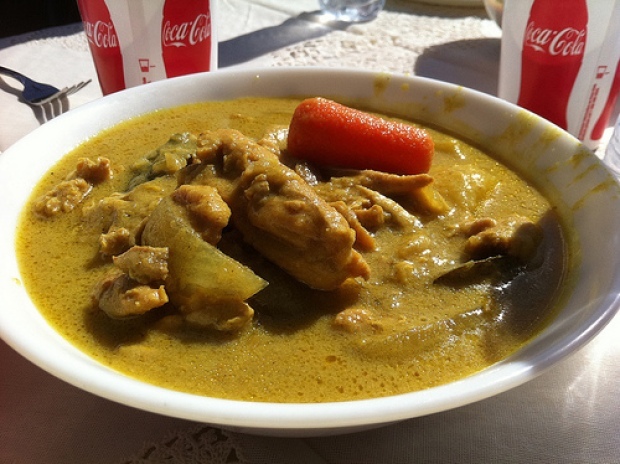 Next came the ubiquitous yellow chicken curry. Filled with chicken, carrots, onions, potatoes and spiked with a hit of coconut, this was better than anything I’ve had at a restaurant. My favorite dish of the meal came next. I’m not sure what this chicken was spiced with (I think I detected coriander but I’m not sure what else), but it was fried to perfection: crispy on the outside and juicy on the inside. A simple but flavorful vegetable and tofu stir-fry also came around. Flecked with bits of baby corn and mushrooms, this lighter plate was welcome after so many rich dishes being passed around. There was simply too much going around for me to capture it all: soups, noodles, and more curries made their way around our communal table until I couldn’t take any more. And yet there was still dessert. Fried bananas and black sticky rice lent our meal a sweet finish before we got up to explore the rest of the Wat Mongkolratanaram. With a thriving vegetable garden, a Sunday school for children, and cultural programs for the Thai Buddhist community, the temple is a Berkeley gem. I may have been late in learning about the East Bay’s unique brunch secret, but I’m making up for it now.